Publisher: Ulyssian Pubns, Spokane, Washington, U.S.A. NATURE / ANIMALS / SPIRITUALITY. This is a natural history story of the life of a river otter and the autobiographical complement of the otter&#x2019;s researcher. Their unique journey through life transcends two worlds: the real and the spiritual. Travel with them through seasons and years as they discover many remarkable mysteries of the natural world, evoking wonder at its beauty and diversity.<br /><br /> The story of &quot;The Otter Spirit&quot; is based on true accounts of observations the researcher recorded firsthand, and on imagined events that very credibly could be observed, based on reports documented in the referenced literature. 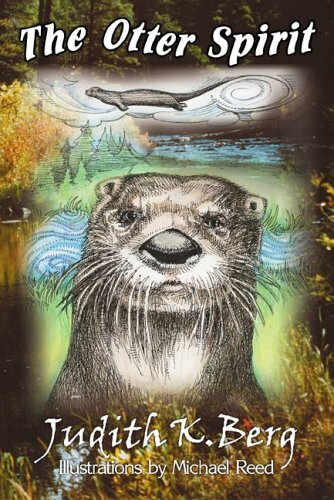 The dialogue and expression of feelings among the otters and other animals in this book are admitted anthropomorphic interpretations of events told in the story. However, facts articulated in the book are real and substantiated by direct measurement by the researcher or authenticated in the references.<br /><br /> Hope prevails that, through the tale of the Otter Spirit, a genuine appreciation of these marvelous animals and the environment they call home will be conferred to the reader. For some, a greater passion will drive them to research the literature and, perhaps, go beyond, to find their own Otter Spirit on a river, in a forest, on a mountain yet to be explored and personally realize the sacred gifts that Nature offers those who take the time to hear the Ancient Voices.<br /><br /> Includes 27 photos/illustrations and index. Emerging from a traumatic period in her childhood, Judith K. Berg vowed to invest her life in making a contribution. She didn&#x2019;t know how that would manifest itself until a university professor invited Judy to conduct observations in an atypical captive environment as part of a study on African elephant behavior. She knew then that her contribution would be towards the preservation of endangered species of the world. Her graduate research on elephant vocalizations and associated behaviors quantified for the first time that elephants communicate with low-frequency sounds that are known to be below the range of human hearing.<br /><br /> Armed with her graduate degree, Judy became a Research Associate at the San Diego Wild Animal Park. After completing ten years&#x2019; research on African elephants, she directed her behavioral studies to endangered Japanese serow, Chinese goral, okapi, and barasingha deer. Concurrent with her research, she also participated actively in local and regional nature conservation issues.<br /><br /> When Judy relocated to Colorado, she was determined that she would conduct the final project of her career on an endangered species in the wild. With encouragement from a number of wildlife professionals, Judy chose the state-endangered North American River Otter on the Colorado River in Rocky Mountain National Park and surrounds. The many hours spent in this spectacular environment connected Judy with Native American spirituality and even closer to the wonders of Mother Nature and her children.<br /><br /> From every research project that Judy conducted emerged publications in the scientific and popular literature, as well as presentations to international professional and secular audiences. Although she fulfilled her life&#x2019;s goal, her personal drive and commitment led her to write &quot;The Otter Spirit.&quot;<br /><br /> Judy, her husband David, and their special companion Rusty are currently enjoying their retirement and continuing to contribute to the world of natural history in Eugene, Oregon.